Around Crucible you will overhear the topic that "Earil has a problem with Brithaur". Find Earil at Earil's Mysteries and speak with him about Brithaur. Find Brithaur and ask about his problem and what you can do to help. You may bring Brithaur the items he requests, kill him, or find a way to get him arrested. If you decide to kill him, take his heart as evidence. Return to Earil for your reward. Around Crucible you will overhear the citizens speaking about someone named Earil who is having a problem with another citizen named Brithaur. You will receive a quest update saying maybe you should find Earil and ask him about it. Earil can always be found in his store Earil's Mysteries, which doubles as his house. 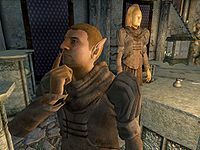 Speak with him and he explains that the shop owners in Crucible are constantly being robbed by a Bosmer named Brithaur. He wants you to make Brithaur stop stealing from the shops in Crucible and he doesn't care how you accomplish the task. A quest update will tell you that maybe you should talk to Brithaur before making any hasty decisions. Find him either roaming the streets, sleeping in his house, at the Sacellum, or most often inside a closed shop stealing (although he will likely leave the shop the instant you enter). Talk to Brithaur, he will tell you that he wants to complete his collection and he can't stop stealing until he does. However, all he needs are flawless pearls, and that if you bring him five of them, he will then leave the shops alone. At this point you now have three options. You can kill him, bring him the five flawless pearls, or if you are far enough along in the Main Quest, have Brithaur 'thrown into the dungeon'. If you decide to take pity on Brithaur and help him out, flawless pearls can be found in a variety of locations. Most often Baliwogs can be found carrying them in the swamps of Dementia. A few can be found on some of the awnings in Bliss and the famed rooftops of Crucible, or purchased from occasional shop owners. If you have become the Duke/Duchess of Dementia by completing the Ritual of Dementia (or, if you chose to become the Duke/Duchess of Mania instead, finished the Main Quest and become Sheogorath), you can speak with Kithlan in the House of Dementia about Brithaur causing troubles in town. He will tell you that he had regarded Brithaur's exploits as harmless up until now but that if they are becoming a problem, "it will be handled". Presumably this option was supposed to have Brithaur thrown into jail or tortured by Herdir, but in fact nothing occurs and Brithaur continues to wander around town unaffected, still committing his random acts of petty theft. Nevertheless, Earil will accept that you have handled the problem. If you choose to kill him, do so by whichever means favored. He can be found sleeping at his house very late at night and sitting in the Sacellum occasionally, assuming he is not stealing. Once he is dead take his heart to show Earil for proof. Whatever you do, return to Earil, who is overjoyed and cannot wait to tell the other shop owners. He will give you a leveled amount of gold for your troubles. 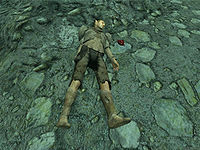 If you chose to kill Brithaur and you give Earil the heart, you will receive the "Bonus Reward" amount in the following table; in any other case, you will receive the "Standard Reward" amount. It might be that you see Brithaur roaming the streets after you "got him thrown into the dungeon". You can speak with him about the flawless pearls and he'll say they would be "perfect". It appears that even after giving him the five pearls (if you chose to do so), Brithaur has not given up his life of crime. If you talk to him he will tell you how fortunate you are to have such a full purse, whereupon he will steal 1 gold from you. Killing Brithaur counts as murder; should you wish to remove him lawfully, a command humanoid spell coupled with a visit to the dangerous countryside or a Frenzy spell such as the Blessing of Mania will solve the issue. 10 I've heard that Earil has a problem with Brithaur, and wants something done about it. I should go and speak to him about it. 20 Earil has offered me a reward if I can 'get rid' of Brithaur. I'll need to find a way to get Brithaur to stop stealing from the shops in New Sheoth. Before I make any hasty decisions, perhaps I should speak with Brithaur. 30 Brithaur has refused to stop his crime spree because his "collection" isn't complete. I may be able to use this to my advantage. I need to bring five Flawless Pearls to him. Otherwise, I may have to seek more creative or violent means to obtain Earil's reward. 40 I've given Brithaur five flawless pearls. He's now agreed to leave the shopkeepers of Crucible alone. I should go tell Earil the good news. 60 Brithaur is dead. I should tell Earil that he is no longer a problem. 70 Due to my influence in New Sheoth with the House of Dementia, Kithlan has agreed to have Brithaur thrown in the dungeon permanently for his crimes. I should tell Earil the good news. 200 Finishes quest Earil thanked me for taking care of Brithaur, and has given me a reward. It is possible to use the console to advance through the quest by entering setstage SE35 stage, where stage is the number of the stage you wish to complete. It is not possible to un-complete (i.e. go back) quest stages. See SetStage for more information. This page was last modified on 22 January 2019, at 06:06.